Happy Friday!! We are having an unseasonably warm day in the chilly Midwest, and it feels great to open the windows and let in the fresh air. The sunshine and cool breeze make me so happy! 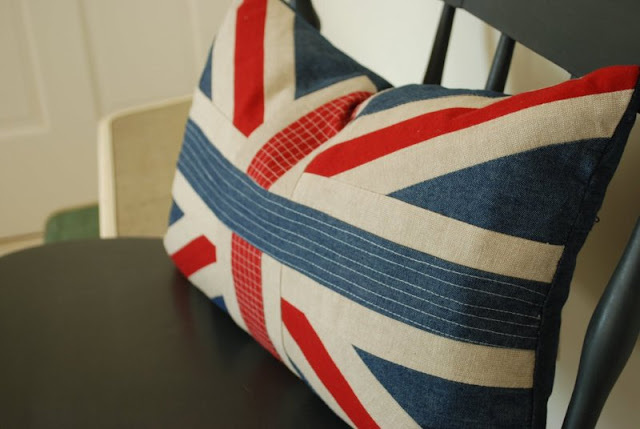 Another thing that makes me happy is this adorable Union Jack pillow that I won thanks to Kristin at My Uncommon Slice of Suburbia.. The pillow is courtesy of Robyn Story Designs, and it has found a home in the bedroom shared by my two oldest sons. 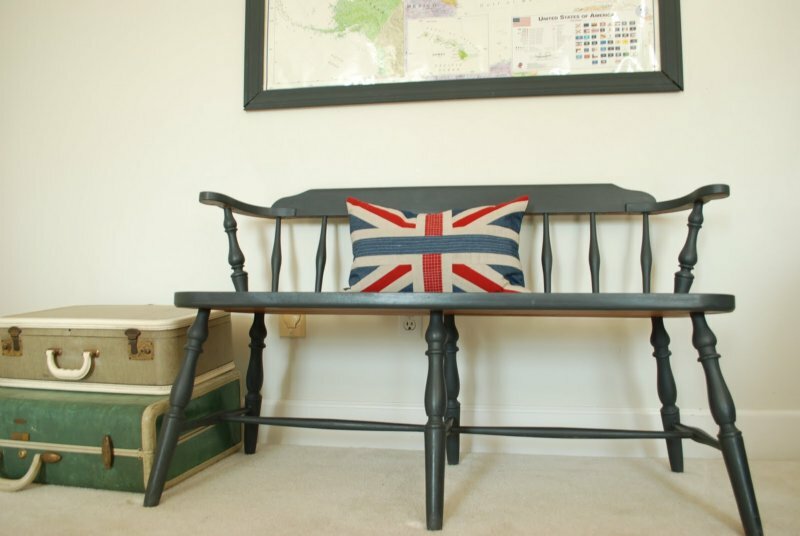 Robyn Story Designs is an Annie Sloan chalk paint stockist, so I suppose it's appropriate that the pillow resides on the bench I painted with ASCP "graphite." I also won a great ASCP apron that I can wear when I tackle my next painting project! There are so many great giveaways out in blogland. I don't usually win things and most times I don't even enter to win things. But, I'm thinking the odds are pretty good. So, what are you waiting for? Go enter a giveaway. Today may be your lucky day! That pillow is perfect there. So glad you won one of them. Hurray for you on your wins!! I LOVE that pillow! It looks perfect on the bench! We are at 54 here in Chicago! It makes me want to go out and play!! LOVE that pillow!! Looks great..enjoy! Congrats! Love the pillow. Happy weekend. great pillow and it looks great on the bench. We are warm here in Canada too - 45 but the temp is falling now. Congratulations, it looks great there! Lucky you! That pillow is so cute. I entered a few of those giveaways, but didn't win. Glad that you did though. You had the perfect spot for it! Congrats!!! Love where you put it! It looks great on the bench!